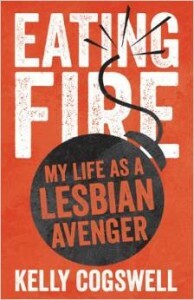 In Eating Fire: My Life as a Lesbian Avenger, Kelly Cogswell whirls the reader into her life as a cofounder of Lesbian Avengers in New York City, 1992. The book’s title comes from one of their first actions where several Avengers learned how to eat fire as a sacrament, taking the fire of action into their hearts and bodies to counter the fear of violence against lesbians. 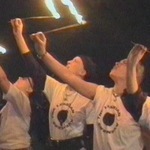 And during the first “honeymoon” years, the Lesbian Avengers used that fire to confront violence against lesbians as well as the social and cultural forces that erased lesbian presence and silenced our voices, pulling more and more lesbians into grassroots organizing and demonstrations, with spin-off groups around the country. Cogswell writes not only of the actions but the relationships, the varied perspectives, and many differences between the women. Especially interested in race and class and how a focus on race or class can sometimes obscure other important aspects of identity, she looks back at the internal tensions and gradual disintegration of the group, trying to understand what tore the Lesbian Avengers apart. Her analysis is complex and captures the difficulties of untangling oppression when each identity confronts so much more than one “ism.” But Cogswell insists that no one group alone has the right to plant the flag of freedom. Eating Fire is both a thrilling account of social activism and a memoir of a lesbian engaged deeply in lesbian liberation. A lesbian who questions the belief that with legal equality the need for lesbian visibility and lesbian voice will end. Read it for the story of the Lesbian Avengers alone. But be prepared for journeys into love and betrayal, with questions on identity and our obligations to others. Kelly Cogswell, Eating Fire: My Life as a Lesbian Avenger (2014, University of Minnesota Press).